Renault's Mégane II is a mainstay in the compact family car segment, rivalling the Ford Focus, Volkswagen Golf, Toyota Auris and a host of other mainstream hatchbacks and small saloons. Renault's Mégane II is a mainstay in the compact family car segment, rivalling the Ford Focus, Volkswagen Golf, Toyota Auris and a host of other mainstream hatchbacks and small saloons. 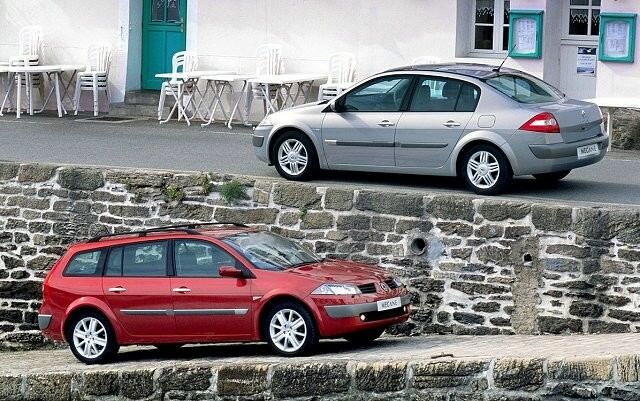 Being French, the Mégane II brings some real style to the sector, taking a bold styling direction with its curvaceous rump and striking grille and headlamps up front when it was introduced in 2002. Styling aside it's all fairly conventional family car fodder, though Renault's obsession with EuroNCAP scoring does mean it's among the safest choices out there. The second generation of French cars to wear the Mégane badge from Renault competes against the usual mix of Japanese and European hatches and saloons for family car buyers' attention. The Mégane II is a good way of getting it too, with its good looks far more interesting than the class norm - perhaps too extrovert for some buyers. Available in both three- and five-door hatchback variants, Renault also offered the Mégane II as a saloon, estate (Sport Tourer in Renault speak) and even a cabriolet version - the open car featuring a neat folding hardtop and badged Coupe + Cabriolet. Choice then is extensive, as is the trim line-up, which was Renault's norm during the Mégane II's 2002-08 production run. Specification options include Authentique, Dynamique, Expression, Monaco and the range-topping Renaultsport models. All come reasonably well equipped, with Privilege particularly generously specified. Engine choices include 1.4, 1.6, 2.0, 2.0T petrol units and a choice of 1.5 dCi diesels with 85- or 105hp - or a 1.9 dCi with 115- or 130hp. The Renaultsport model, with its 2.0-litre turbocharged petrol engine with 225hp, is noteworthy too; based on the three-door hatchback, the Mégane II Renaultsport was, and remains, a hugely entertaining performance car. Often, and rightfully, compared with sports- and supercars, the Mégane II Renaultsport really is a phenomenal driver's car and worth looking out for if you want giant-killing performance and handling in a relatively practical package. The rest of the range did gain some halo glow from the existence of that Renaultsport machine, though just don't expect your 1.5 dCi Expression saloon to be chasing down Porsches in the Wicklow Mountains. Space in all isn't overly generous, the rear seat accommodation a touch tight, while the boots on all but the Sport Tourer aren't huge either - despite that bulbous rear. Build quality isn't going to be up with the best German offerings either; Renault's reliability in the early 2000s was not its finest. Safety should be good though, as the Mégane II scored very well in crash tests when it was launched. It might not chase down sports cars but that 1.5 dCi diesel engine will be the choice for many of you out there. It's not mighty, but its performance will be adequate, and economy should be good too. Pick a middling trim, and the body style that suits your preference, whether that be hatchback, saloon or Sport Tourer (estate). Renault's dramatically styled Mégane II makes a bold statement in the family hatchback class and drives well. The only nagging doubts as a used buy relate to its reliability, while space isn't as good as many inside. If you're after a giant-slaying performance hatchback though the Renaultsport model is unsurpassed for the price.